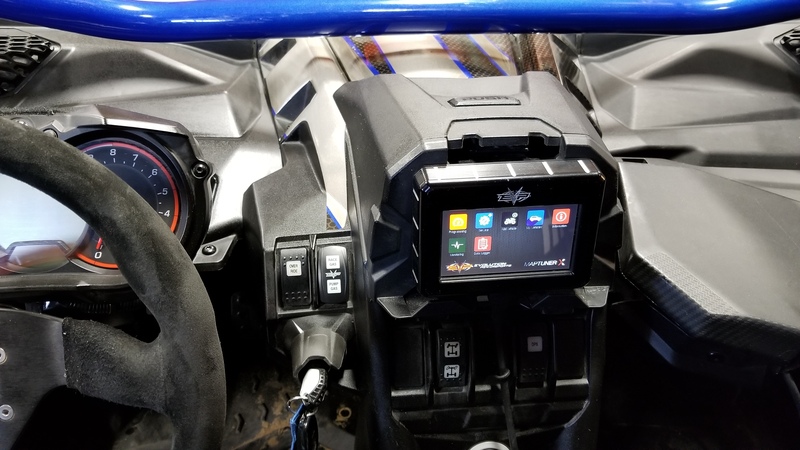 Evolution Powersports (EVP) a leader in the powersports industry for software tuning, exhaust systems, intake systems, clutching and turbo systems is proud to introduce an industry first V-MAP multi-map ECU tuning for the 2018 Maverick X3 (Or 2017 X3’s fitted with the 2018 fuel pump). 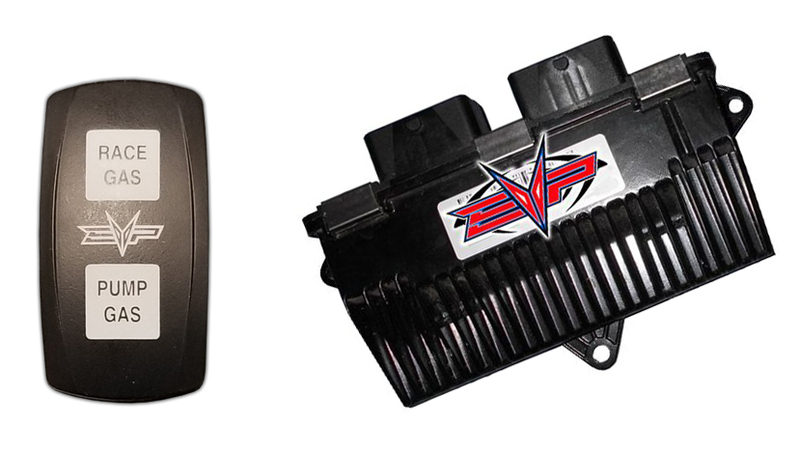 EVP V-MAP technology allows customers to switch between pump gas and race gas tunes using the OEM Eco Mode and Sport Mode switch. When Eco Mode is selected, the engine produces approximately the same power as our Stage 1 (190 HP) tune whereas when Sport mode is selected, the power is 215 HP on 95+ Octane fuel. This allows the ultimate in flexibility for those who want the benefits of a high-octane tune when 95 octane fuel is available, with the ability to safely run in Eco mode with better than stock performance when only 91 octane fuel is available. Additionally, tunes can be switched between ECO and Sport without stopping and can be used as a “push to pass” mode. To successfully achieve a multi-map function with the OEM Can-Am / Bosch ME17.8.5, careful disassembly of the ECU code was required. This painstaking task required over 1000 combined hours of coding, testing, tuning and field testing to accomplish this unique ECU function. By using the OEM ECO mode to limit power, we can successfully reduce the engine TQ and boost to achieve a real dual mode ECU. Last edited by EVO 1; 01-12-2018 at 07:19 AM. lcommanderl, mgrotel, Auztone and 1 others like this. You know Jim showing a picture of the code is just gonna give the Software Pirates some extra help in copying your guys hard work. LMAO I think this is awesome . Guys that want to run Mexico could even get a PEEEEmex Tune for there Peee fuel. What's the local barometric pressure where you made that video? Its not the chinese I promise you that much. This is such and awesome product and the options it now provides can be very handy depending on your needs. Its about 95 kpa. Boost on the gauge is roughly 19 lbs on "Race Gas Mode", but it is always about 1.5 lbs higher in the field. Do you prefer to watch it in kpa? I have to say, that's pretty damn awesome you can switch it in the middle of a pull. I like kpa better than psi - I am just used to it. 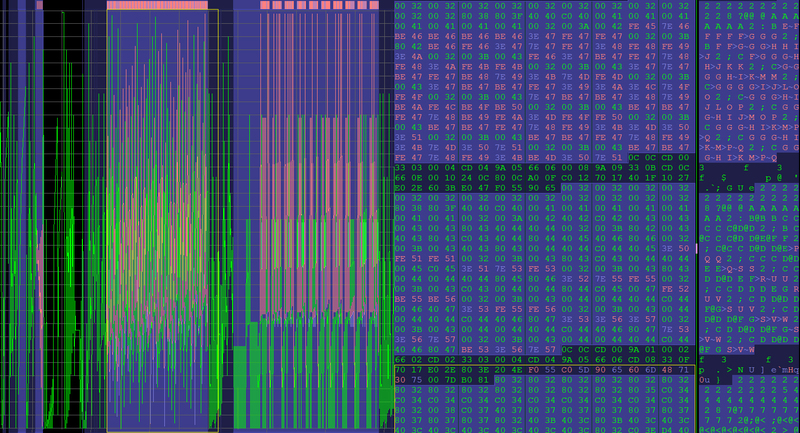 Yes, it is cool to switch between tunes on the fly!